Yet there is also “the evil day” referred to in the Lord’s prayer. 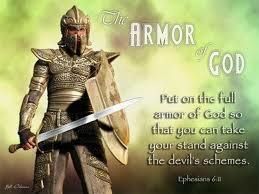 When we ask the Father to “give us this day,” besides our personal need for the basic necessities of life, yet another way to understand our prayer request is to understand that we are actually asking God to “MAKE US READY” FOR DEMONIC DELUSION AND DEVILISH DECEPTION.” So on a personal dimension, the evil day is anytime the enemy attacks us. The most clever, insidious form of attack made on the elect has actually been permitted by God Himself. Satan cannot touch God’s people unless God Himself gives the enemy permission. Paul even warned the Thessalonians that in the last days, God would send “strong delusion” so that many of those who follow Him would believe a lie. Through spiritual ignorance, too numerous among devoted churchgoers are those I have found to be in an awful place, where they actually oppose the very truth of God in support of demonic deception. Demons and devils are clever strategists who distract by the obvious in order to dupe the elect by the unseen. I know their various strategies very well for religious devils worked with me for about 20 years. Without the grace of God, I admit that I too would be poor, blind and naked in the spirit today. God resists the proud but gives grace to the humble. I have been given grace to escape many demonic traps that were set for me because I humbled myself to the truth. I believe that we are living in the last church age of Laodicea–an age of strong delusion and deception. On a personal note===In my counseling practice, I have worked with several innocent people whom devils set out to spiritually destroy in this season, due to their lack of knowledge of Satan’s secret devices and deceptions. I have also witnessed that true believers in Jesus Christ of Nazareth are in the most danger of deception because the unseen entities assigned to us are very skilled at using our faithfulness and our commitment to the word of God against us. The primary error of the faithful is the false assumption that God will not allow us to be deceived by the devil. Yet the Lord’s warning that we are to pray that our Father not allow the enemy to lead us into temptation but deliver us from evil on a daily basis strongly speaks to me that THE EVIL DAY IS EVERY DAY! Therefore, each BLOG is designed to GET YOU READY for the “next evil day.” To be ready is to assume that strong delusion has already been released in our time. With these letters, my associate mentors and I are committed to helping you prepare to escape every trap set for you by the devils and demons assigned to you. Believe me. I know from experience. Your traps have long been set in motion. Besides being spiritual, my nature is also very practical. I am well aware that my calling is not very popular. So I don’t expect everyone to be receptive to these blog posts. I also realize that I am called “to the few,” “the remnant of God. I expect many will be unreceptive and un-responsive. I wish you well and extend my farewell to you now. For the rest of you, I will commit myself to ensure that when our Lord and Saviour comes again and if you are alive, you and yours will be wise virgins. The foolish are too braindead for me to reach.